One of the easiest and most effective ways for establishing your personal brand is through public appearances. When you get in front of an audience, whether it’s an auditorium full of people or just a handful of co-workers, you have the opportunity to convey your brand message and make a positive impression. 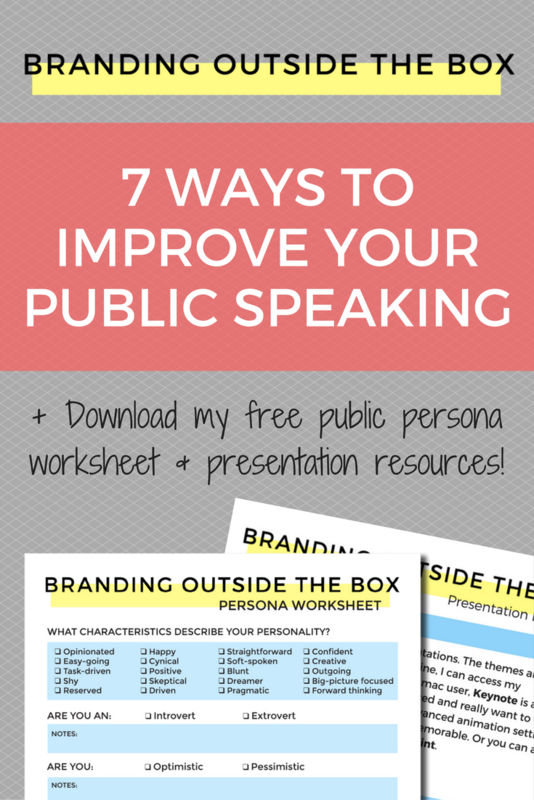 I understand that public speaking doesn’t come naturally to everyone. Many have anxiety about speaking to a group of people, some have trouble connecting with their audiences, and others struggle with conveying information in an engaging, effective way. 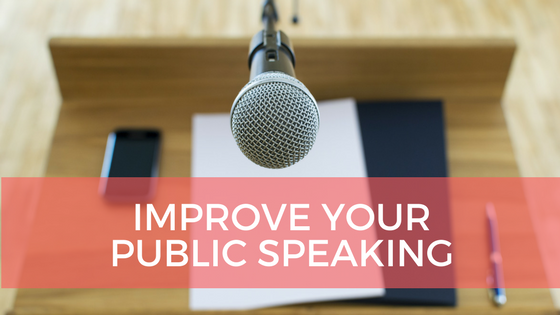 But whether you’re presenting at a company meeting, delivering a keynote speech, or pitching a new client, there are several ways you can improve your public speaking. 1. Know your audience. The first step in connecting with your audience is to know who they are, what they care about, and what their pain points are—how will you make that aspect of their lives a little easier? I have a presentation called Online Presence 101 that I’ve given several times, and while the meat of the content is the same, it’s tailored to each audience. I wouldn’t address a room full of PR pros in the same way as a group of authors. It’s also important to understand the base knowledge or career level of your audience. I don’t need to explain the importance of building a mailing list to a group of multi-published, bestselling authors, but I may if it’s a group of debuts. 2. Speak to the individual, not the room. I’ve gone to a number of talks and keynote speeches where the speaker seemed to be making eye contact and looking at the audience, but not really connecting with individuals. As a speaker, I understand how much less nerve-wracking it is to focus on the room itself rather than the individuals within it. To make a meaningful connection and convey your message effectively, it’s necessary to speak to the individuals in the room rather than the room itself. A trick I use is to deliver each sentence of my presentation to a certain person. I’ll make eye contact with an individual, tell them something, then move on to someone else. This engages the audience and creates a more meaningful connection. 3. Make it interactive. Not all speaking gigs provide the opportunity for Q&A and the audience may be too big to interact individually, but you can still create an interactive presentation. Pose questions to the audience, prompt them to reflect on a thought or problem. If it’s a smaller group, call on someone to respond and share their thoughts. For bigger groups, ask them to write something down or reflect on a topic for a bit. Again, it’s all about engagement and making each person feel like you’re speaking directly to them. 5. Slow down and stop fidgeting. You’ve probably heard this a thousand times, but it bears repeating. No matter how calm and confident you are when you get up in front of an audience, you will still speak more quickly than you usually do. Whether it’s from adrenaline or nerves, public speaking results in speeding up the pace of your speech. You’ll also fidget more, suddenly realizing you don’t know what to do with your hands, how to stand, or whether or not your hair/glasses/tie/etc. are out of whack. The first thing you do when you walk on stage or to the head of the conference table is to take a breath, find a resting place for your hands, and begin speaking slowly. 6. Do a trial run. Practice may not make perfect, but it certainly helps. It isn’t until that I’ve given a talk at least 5 times that I head into a speaking engagement without a practice run. And even then, I’ll still review my notes and slides to make sure I’m familiar and confident in the presentation. If it’s the first time I’m giving a talk, I’ll often film my practice run so I can review places that felt off or dragged. You’ll gain confidence with each practice run, and that confidence will come through on speech day. 7. Get excited. If you’re just going through the motions, so will your audience. On the flipside, if you’re genuinely excited about the content you’re delivering, then your audience will be, too. Even if your presentation is something dry, like a quarterly budget report or a tech tutorial, make an effort to show a genuine interest in the content. And don’t be afraid to inject some humor to lighten things up! YOU are the most important component of your personal brand, so any opportunity to put yourself in front of people is a chance to establish that. By following these seven tips, you will leave everyone with a positive brand impression.